It’s well known that our mental, physical and emotional health are all connected, but how can craft improve our general well-being? Craft can have surprising health and wellness benefits, from simple relaxation achieved by the rhythm of stitching or crochet, through to reconciliation of emotional conflicts as a result of art therapy. Crafters have reported that creative pursuits have helped in the management of addictions, to reduce anxiety and to calm negative behaviour. The rhythm of knitting and the mathematics required keep the mind focused on the moment rather than letting anxiety take over. Repetition involved in many crafts is soothing and conducive to a state of ‘flow’ – engagement where other worries and stresses are forgotten for at least a while. The American Academy of Neurology reports in a recent study that craft can help protect the brain, stimulating new neurons to maintain cognitive health in middle and old age resulting in improved memory. 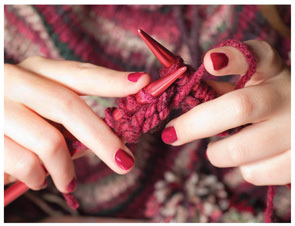 Knitting is being recommended as a pain management technique by health practitioners. At the end of World War 1, this diversional therapy was used to treat soldiers suffering from what we now know as post-traumatic stress syndrome, and has now resurfaced today with psychologists prescribing knitting for pain management and colouring-in as a relaxation technique. also report a feeling of calm. attention to detail, to control impulses and to express themselves and helps in the development of fine-motor skills. However holistic health requires more than physical and mental wellbeing. 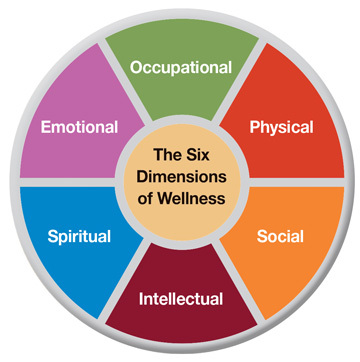 Social, spiritual and emotional aspects are also part of wellness and craft can address these needs. 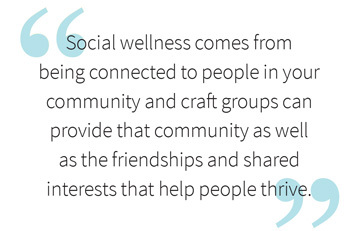 Social wellness comes from being connected to people in your community and craft groups can provide that community as well as the friendships and shared interests that help people thrive. Guilds, men’s sheds and craft friendship groups encourage social connections. Spiritual health involves having a sense of purpose that can come from creating and belonging to a group is even better. Many quilt groups have programs to donate finished works to people in need. Aussie Hero Quilts has had a positive influence on the lives of hundreds of our Defence Force personnel. Angel Gowns helps fill a void for families affected by the loss of a baby. Many groups fundraise to help charities too. Connectedness to tradition and to previous generations can also come from doing craft. 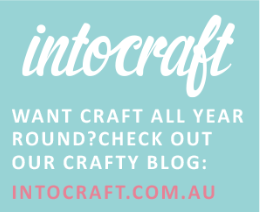 Craft can also promote emotional wellness. It can be a form of creative expression, and even to work through feelings of trauma or loss. Making commemorative works such as memory quilts, painting, journaling, scrapbooking or textile art can all be used to journey through a difficult period. Just the activity of making can provide much-needed clear head space. Intellectual wellness can come from lifelong learning and craft can provide opportunities for exchange of knowledge, learning from each other and teaching others. People who do craft report mental health benefits such as reduced stress and less anxiety. At the Sydney Stitches & Craft show, we’ll promote the wellness benefits of craft through our new Craft Wellness Wheel, educating people about the powerful role craft can play in our general health and well-being.